The genome of T7 phage is about 40k bp, double stranded and linear with 160 bp long direct repeats at both ends. The genome encodes about 56 genes. Upon binding to the host cell surface, the virion changes its conformation and extends a tube, driving the tail tube through the cell envelope leading to viral genome entry.
. Gene 0.3 that protects T7 genome from various type I restriction systems, gene 0.7 that encodes for a serine kinase that inactivates host-catalyzed transcription, gene 1 which encodes for the T7 RNA polymerase and gene 1.2 that inhibits host dGTPase.
. Then, class II genes are expressed from about 6 minutes. The 1.1, 1.2 and 1.3 genes are transcribed early by host polymerase and later by T7 polymerase. 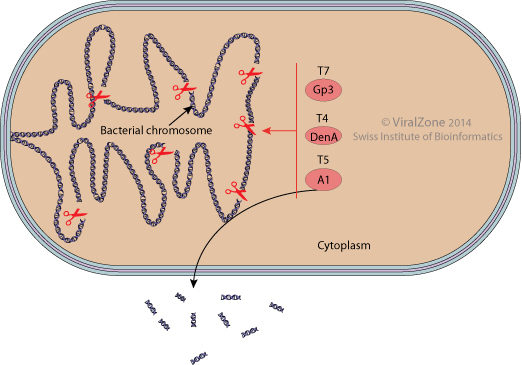 Transcription of class II genes is controlled by the class II protein lysozyme gp3.5 by a feedback mechanism. 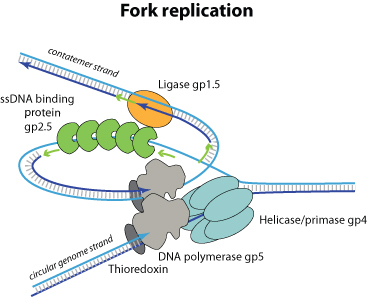 They include proteins involved in genomic DNA replication such as DNA ligase gp1.3, the single stranded DNA-binding (SSB) gp2.5, the helicase/primase gp4 or the exonuclease gp6. 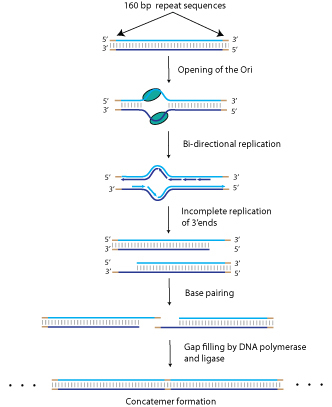 T7 replication is bidirectional and since T7 DNA is linear, the first round of replication produces two incomplete duplex molecules with 3' single stranded extensions.
. Class III genes are dedicated to virion assembly, DNA packaging and cell lysis. The terminases subunits gp18 and gp19 select the right end of the concatemeric DNA thus initiating encapsidation. Once the unit-length DNA is translocated to the prohead, the terminase recognizes and cut the left end of the genome. After completion of packaging, the tail proteins cooperatively assemble on the filled head.
. Lysis involves three steps corresponding to each of the three layers of the cell envelope: inner membrane, peptidoglycan and outer membrane.Two proteins, an endolysin and a holin are required for programmed host cell lysis. 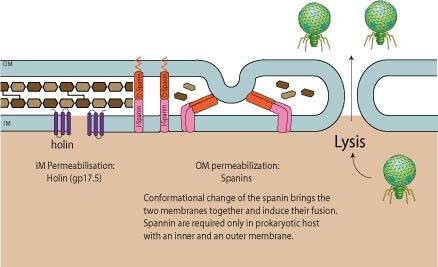 Additional proteins called spanins (spanin 1 and spanin 2 ) are also involved in the process leading to release of virions. 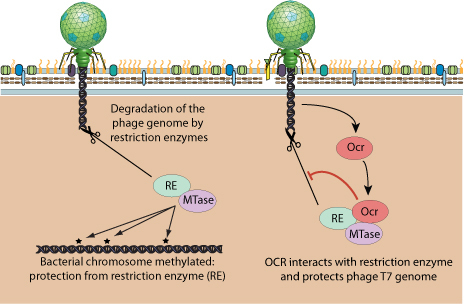 Early bacteriophage genes are transcribed by the bacterial RNA polymerase. 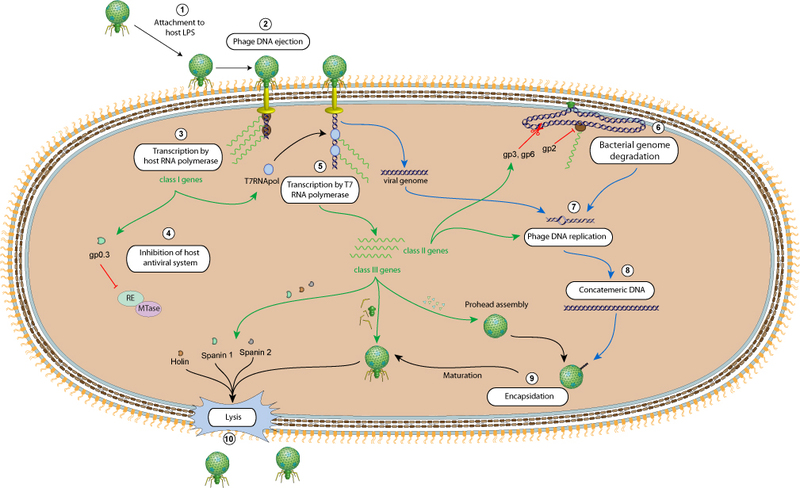 This step includes transcription of genes involved in host-virus interaction, and inhibition of bacterial defenses, as well as other class I genes whose function remains to be determined. Once the T7 RNA polymerase is produced (gene 1), it will take over the transcription of the rest of the genome. The first three genes in the class II (1.1, 1.2 and 1.3) are transcribed by both the bacterial RNA polymerase early and then by the T7 polymerase.